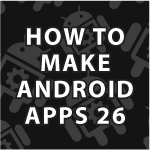 In this tutorial I’ll create an Android Tab Layout example program. It will show how easy it is to create the tabs and then open new fragments on screen when they are clicked. Everything works easily when we use the callback interface TabListener. In the next video we’ll make it so we can swipe through our fragments. All of the code used can be found below under the video.